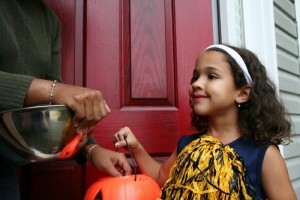 For This Year’s Halloween, Choose Candy Made with Xylitol! You probably have memories of your own Halloweens when you were a kid. You know what that sense of anticipation feels like waiting for Halloween to come, and that giddy, nervous sensation as you stand on a neighbor’s porch, waiting for candy. But you probably have memories of getting a filling, too. And though getting fillings is a much more comfortable experience now than it was in the past, you’d still like to see your own little one get through Halloween cavity-free. So why not stock up on candy made with xylitol this Halloween? Xylitol is a natural sweetener derived from the fibers of many fruits and vegetables. It has fewer calories and won’t raise blood sugar levels, making it perfect for patients with diabetes. The greatest benefit xylitol provides, though, is protection from cavities. Unlike sucrose, which spurs decay and the growth of bacteria, xylitol promotes healthy pH levels in the mouth and makes it harder for bacteria to stick to teeth, preventing cavities in the process. Where Can I Find Candy Made with Xylitol? The best place to start is the Internet. Both Amazon and xclear.com offer a range of choices. You can also find xylitol candy for sale on websites that cater to customers with diabetes. If you’d like to find something locally, you might try your local health food store or even your local grocery store. It may be harder to find xylitol candy than it is to find Milky Ways and Snickers, but with a little research and a little digging, you can find exactly what you need to make your child’s Halloween fun and healthy. Have Any Questions About The Benefits of Xylitol? If you’d like to know more about how xylitol is different from traditional sugar and what benefits it has for oral health, contact your local dentist or visit xylitol.org. Previous Previous post: Are You At Risk for Cavities?